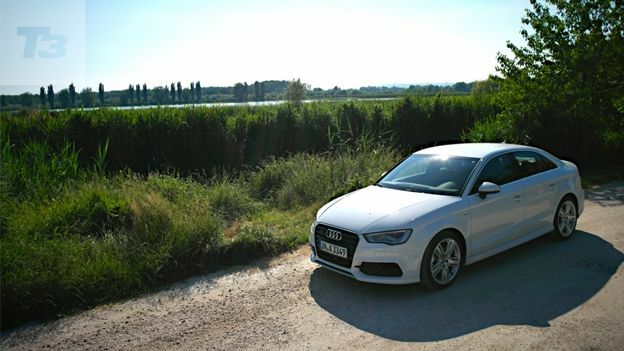 Audi has confirmed it will be launching its new A3 Saloon later this year in the UK with its new Audi Connect in-car software which lets you post to Facebook, Twitter and also view Google Earth thanks to a built-in SIM-card slot. According to Audi the A3 Saloon will be targeting tech-loving young professionals when it finally hits the roads in around October. With a touch-sensitive dial the driver can quick draw a letter to navigate the system or start searching for a location whilst connectivity to both Twitter and Facebook means the car will read out status updates, new messages or wall posts. An in-car connector means you can connect your iPhone or Android smartphone and then have the car read out or compose messages, emails and make phone calls through voice-recognition. Its flagship feature however is Google Maps compatibility, by combining Audi's mapping service with Google Maps the 3G Sim-card pulls through live data such as satellite imagery and traffic updates. When picking a location you can zoom in to Street View to see exactly where you need to go, this is all navigated by simply swiping around the touchsensitive navigation dial. The system also has the ability to pull through flight and train information alerting you to any delays and showing you live arrival and departure times. Other features include WiFi hotspot functionality, Fuel Stop and City Events shows you current and upcoming events or things to do in major cities.